Rare early Horsburgh chart of the waters around Hong Kong issued shortly after the Crown Colony's founding. 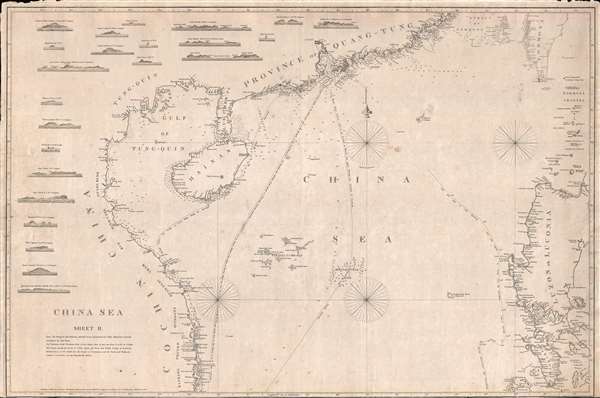 An attractive example of James Horsburgh's rare 1848 China Trade nautical chart or Maritime map of the South China Sea, including Hong Kong, Macao, Canton (Guangzhou), the Philippines, Hainan, the Paracel Islands, southern Taiwan (Formosa), and the northeastern coast of modern day Vietnam. This edition of the chart includes Hong Kong and Victoria, founded as a British Crown Colony after the First Opium War only a few years prior. Four routes from Hong Kong are identified, one for the early part of the 'Northeast Monsoon,' one for the 'Late Season,' one passing by the Philippines, and a third coast hugging route for 'leaky or crazy ships.' There are 23 coastal profiles occupying the left-hand quadrants of the map. This chart expands somewhat on Horsburgh's earlier 1811 chart of the same region, offering a more accurate charting of the China coast, adding shipping route details important to the Hong Kong trade, and incorporating Luzon in the Philippines. Much of the cartography is the work of Daniel Ross, considered the Father of the Indian Surveys, who surveyed the coast of south China between 1806 and 1820. It was first published in 1823, and here exhibits updates and revisions to 1848. Daniel Ross (November 11, 1780 - October 29, 1849) was a British hydrographer and naval officer active in India and the Far East during the first half of the 19th century. Ross is admiringly referred to as 'The Father of the Indian Surveys.' He was born in Jamaica, the illegitimate son of Hercules Ross (1745 - December 25, 1816), a powerful Jamaican-English merchant, privateer ship owner, and naval price agent. His mother was Elizabeth Foord, a quadroon slave who Hercules later freed. Ross joined the Bombay Marine in 1795. From 1806 to 1820 he was assigned to survey the coast of China from Vietnam to Macao. In 1822 he was elected a fellow of the Royal Society. By 1823 he had been appointed Marine Surveyor General of Calcutta, a position he held until he resigned in 1833. Afterwards he retired to Bombay (Mumbai) where in 1838 he was appointed President of the Bombay Geographical Society. He retained the position until retiring in ill-heath in 1849. He is the half-brother of sportsman and photography pioneer Horatio Ross. Good. Overall toning. Minor margin repair and reinforcements on verso. Lower margin narrow and chipped in a few places. Library of Congress, Map Division, G7822.C5 1823 .H6.